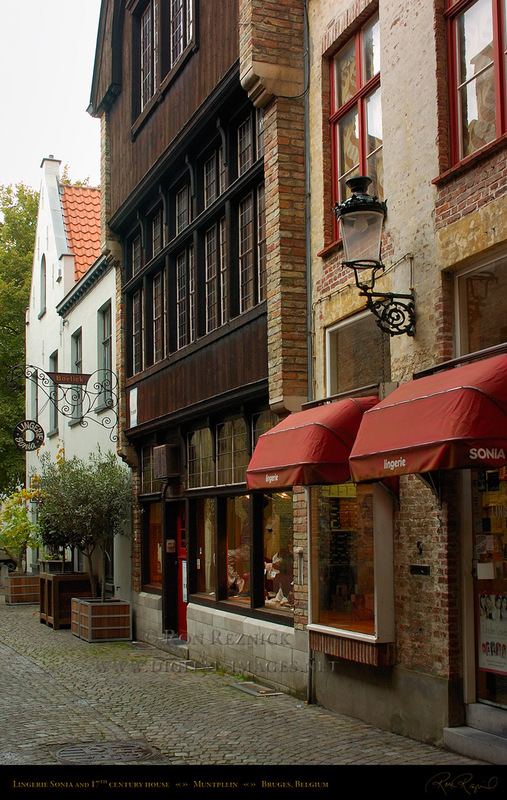 and streets of central Bruges are lined with medieval buildings and 15th-18th century houses. 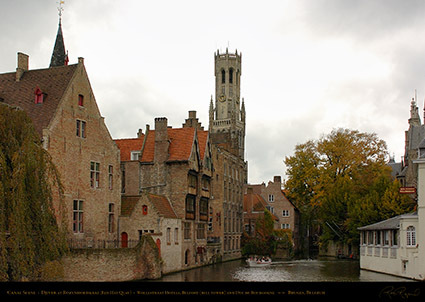 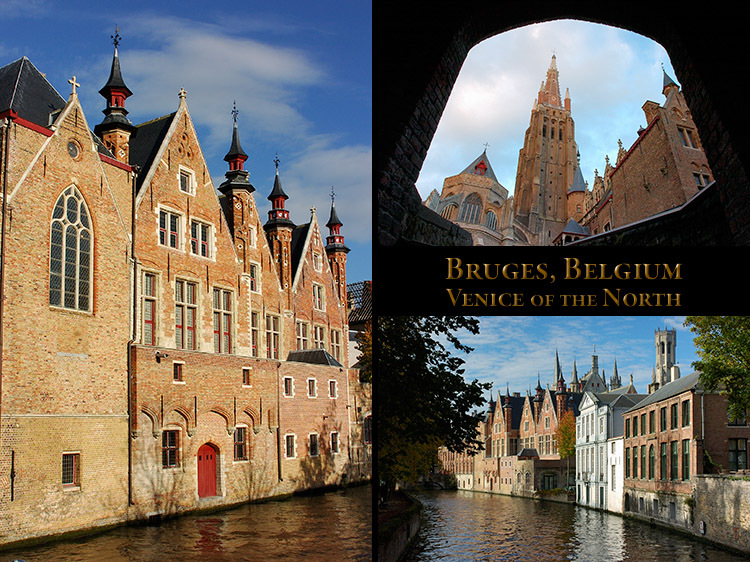 the magnificent architecture of Bruges are displayed on the Houses and Buildings page. Sunrise on the Langerei canal, and 17th century houses with stepped gables on Potterierei. 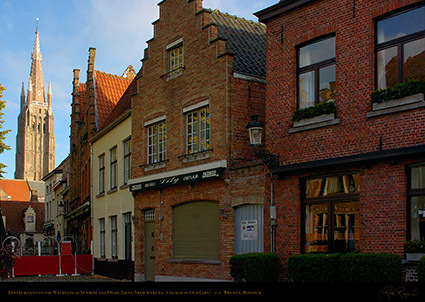 Spinolarei at Sunrise, lined with 17th-19th century houses. 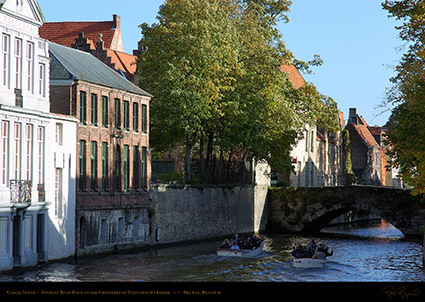 Jan van Eyckplein and the Poortersloge (Burgher’s Lodge) can be seen at the end of the canal. 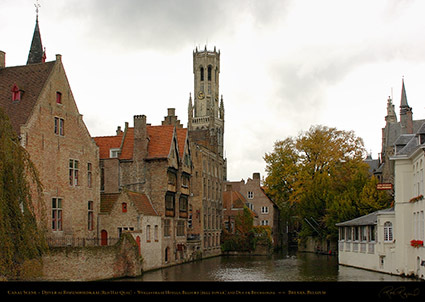 Poortersloge (1417) was a meeting place for wealthy 15th century burghers of Bruges. 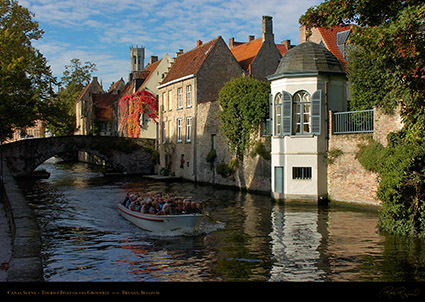 The same scene 2.5 minutes later, with a tourist boat. The light (and weather) changes radically from moment to moment in the Low Countries, but this was a beautiful morning. 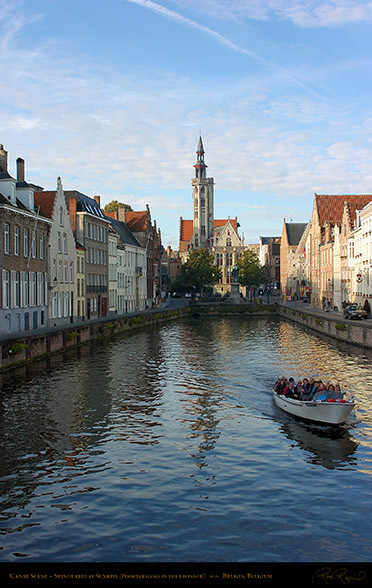 Canals once used for commercial traffic are now only for tourist boats. 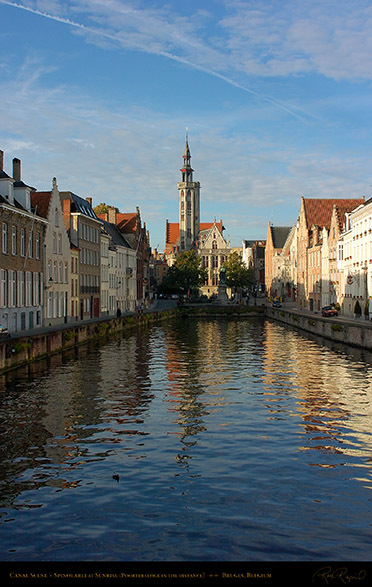 Sint-Annarei canal from the Molenbrug bridge at Langestraat, with the Sint-Annakerk tower in the background at left. Images of this scene were taken on two different days as a compositional study for the photographers I was teaching. 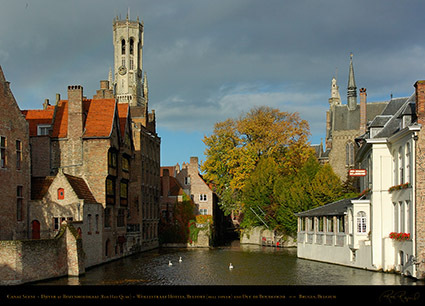 were later replaced with the current stone bridges when the canals were no longer used for transport. 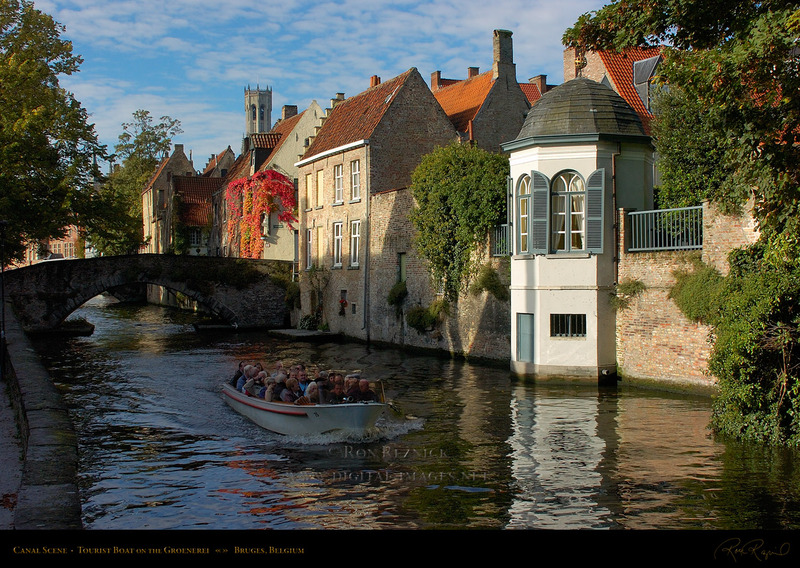 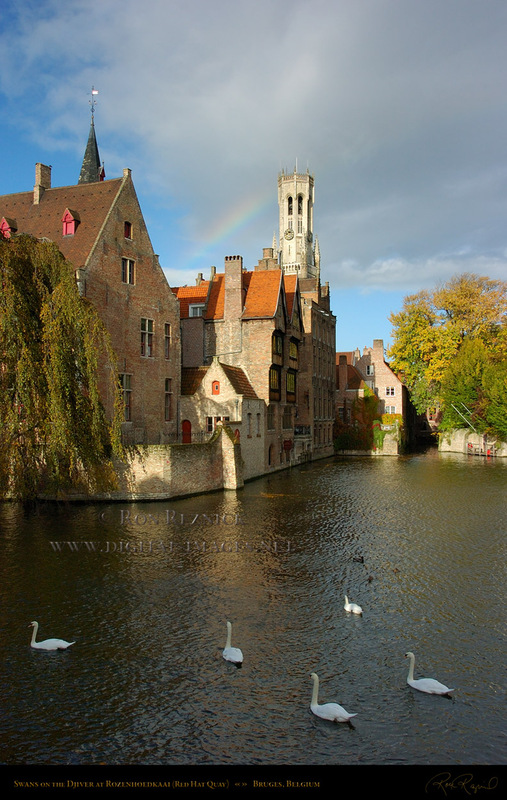 One of the most picturesque scenes in Bruges, both with and without a tourist boat. 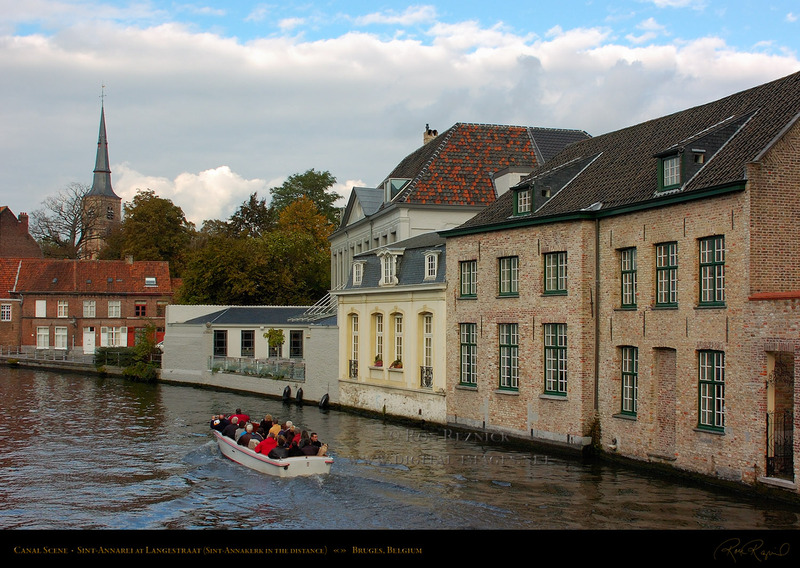 This is the Groenerei (Green Canal) and Dijver junction, also called the Rozenhoedkaai (Red Hat Quay), from which the tourist boats depart. From the left are the Malvenda Perez house, the Wollestraat hotels, the 13th century Belfort (bell tower, one of the signature landmarks of Bruges), and the Duc de Bourgogne hotel and restaurant, just below the medieval towers of Burg Square. 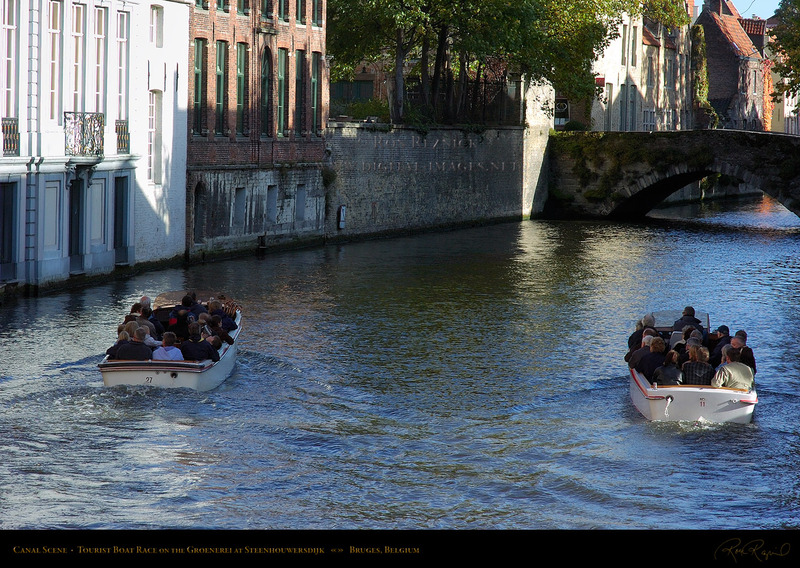 (just beyond the tourist boat seen in the previous image). 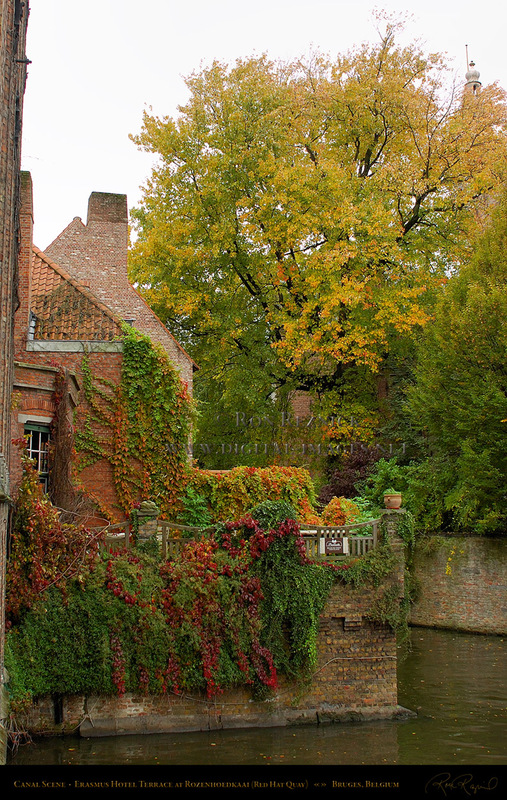 The Augustijnenrei, named for a defunct Augustine monastery which was founded in 1286 (now a park lined with lime trees). the upper left is the Augustine Bridge (the image was taken from the Fleming Bridge at Vlamingstraat). 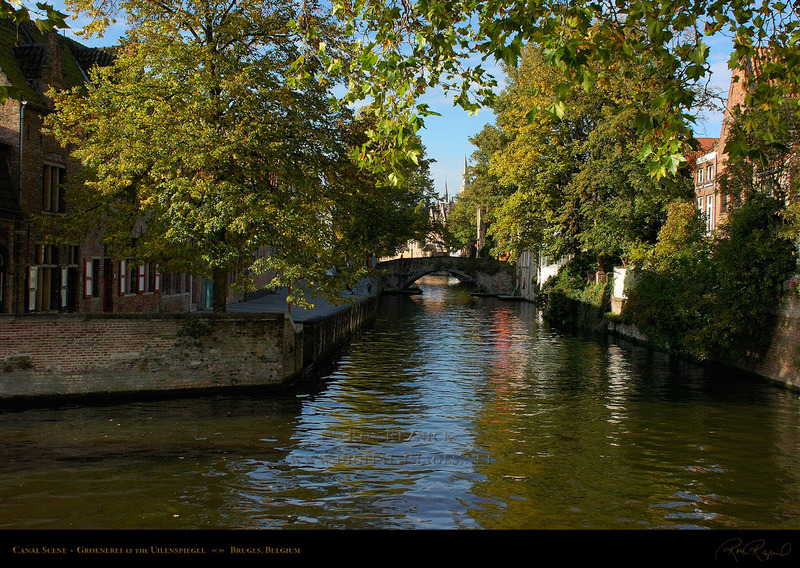 The Groenerei (Green Canal) at the junction with the Coupure and Sint-Annarei canals, taken from the Uilenspiegel Terrace. 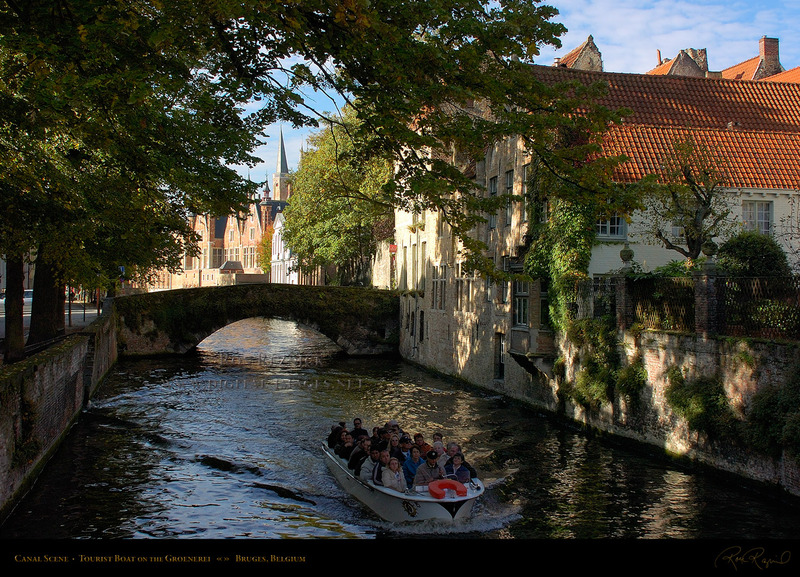 The same scene with a tourist boat. This junction was used to bring cargo from the ring canal into the center of Bruges. bridge, 1642) in the background of the two images above. 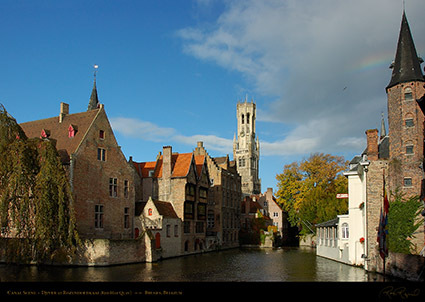 built in 1390 over the Groenerei, west of the scene at left. 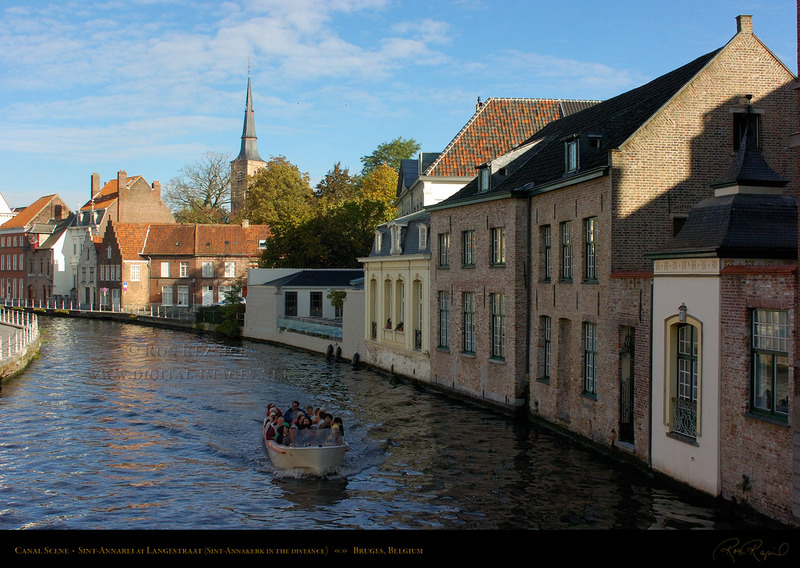 are racing to be the first to reach the Meebrug opening. 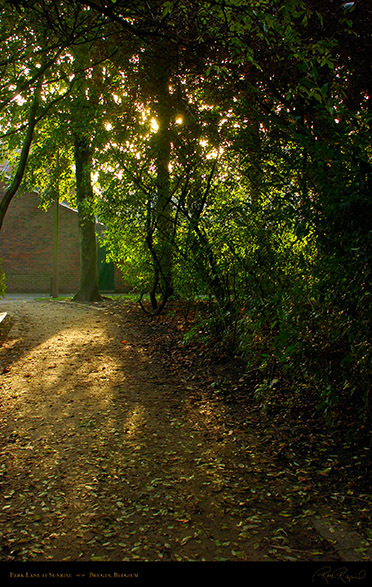 bridge at Steenhouwersdijk near the Vismarkt (Fish Market). or the Mansion of Bruges. 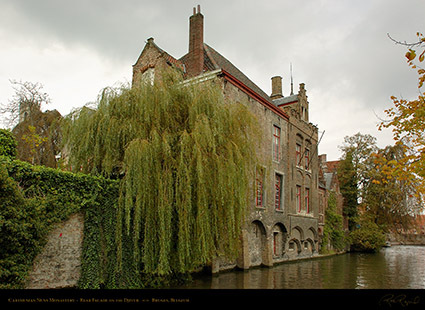 The original structure of the Landhuis was built in the late 14th c.
The castle side shown in the image above was configured in 1528-32 and rebuilt in 1728. Beyond the Landhuis towers are the Gothic towers of the Stadhuis (Town Hall, 1376). 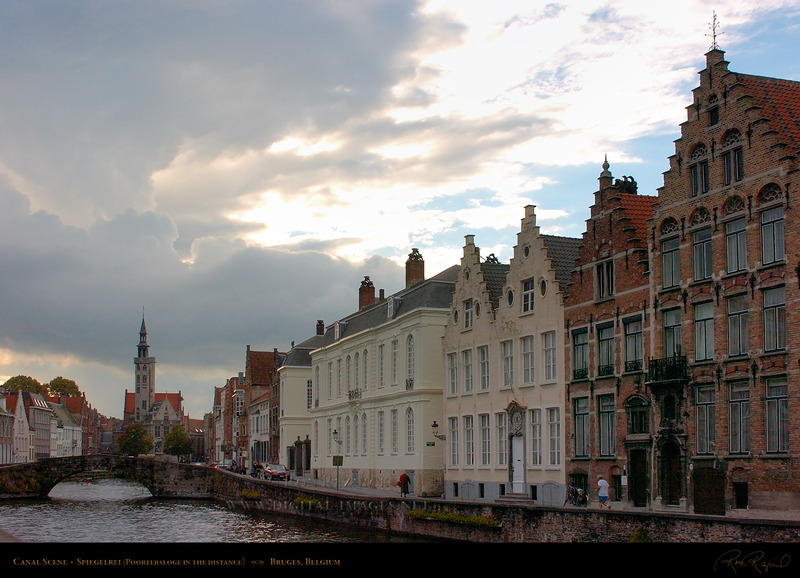 To the right of the Stadhuis is the medieval Belfort (Bell Tower or Belfry, 1240). Houses on Spiegelrei (northern side of Spinolarei canal). 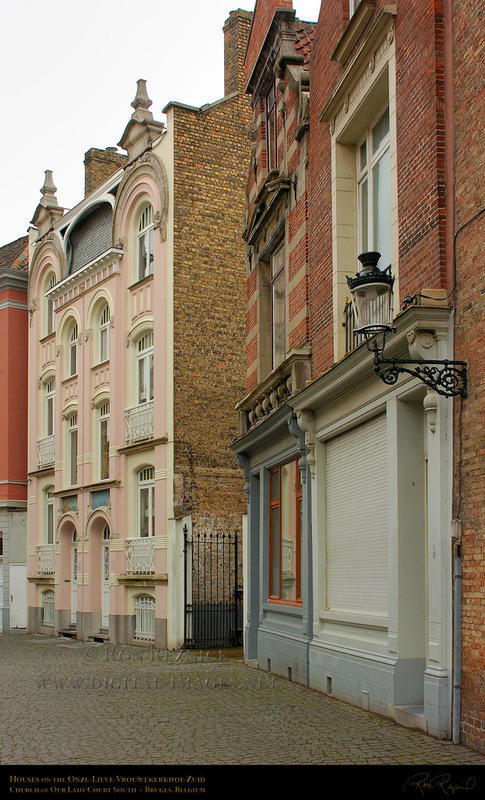 On the far right are two Neo-Baroque houses rebuilt in the 19th c. next to two 17th century houses (consolidated in 1743). 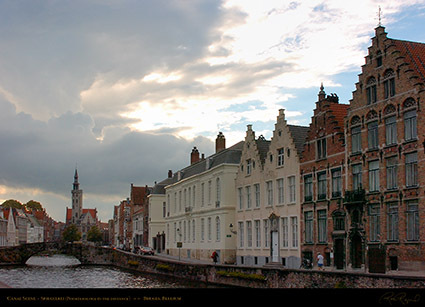 At left are the Koningsbrug (King’s Bridge) and the Poortersloge. 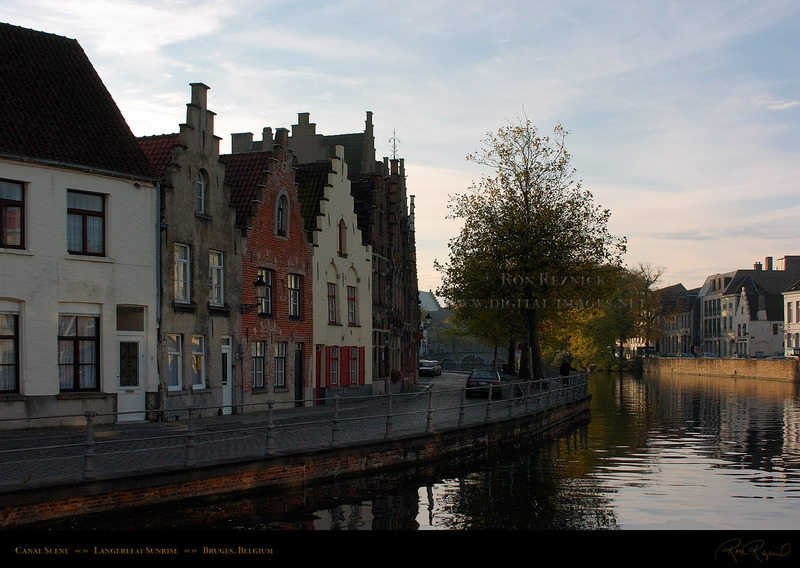 Houses on Verversdijk (the western side of Sint-Annarei canal south of the Spinolarei junction). 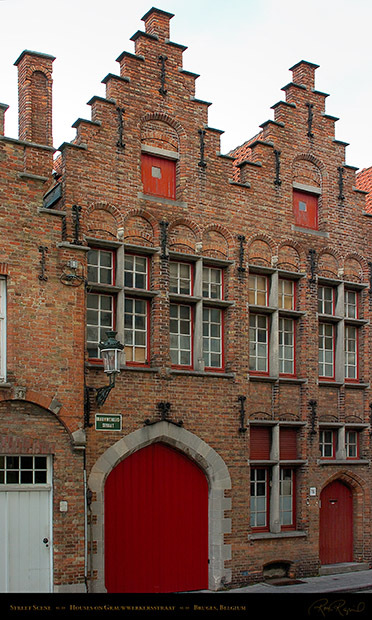 Number 12 (far right), called Den Hert (The Deer), was built in 1655 to replace the wooden facade of a 14th century medieval diephuis (deep house). The rear facade of the Carthusian Nuns Monastery on the Dijver (the front facade is on Kartuizerinnenstraat). 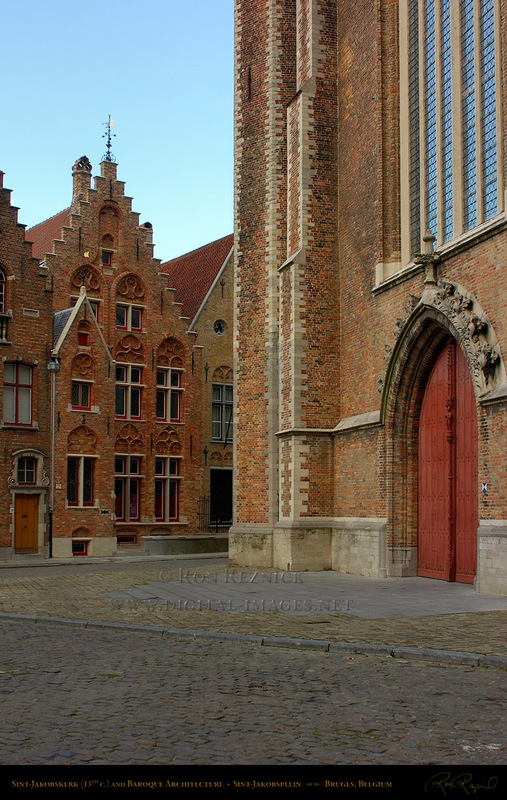 until the order was finally suppressed and the monastery abolished in 1783 (it is now a military museum and chapel). 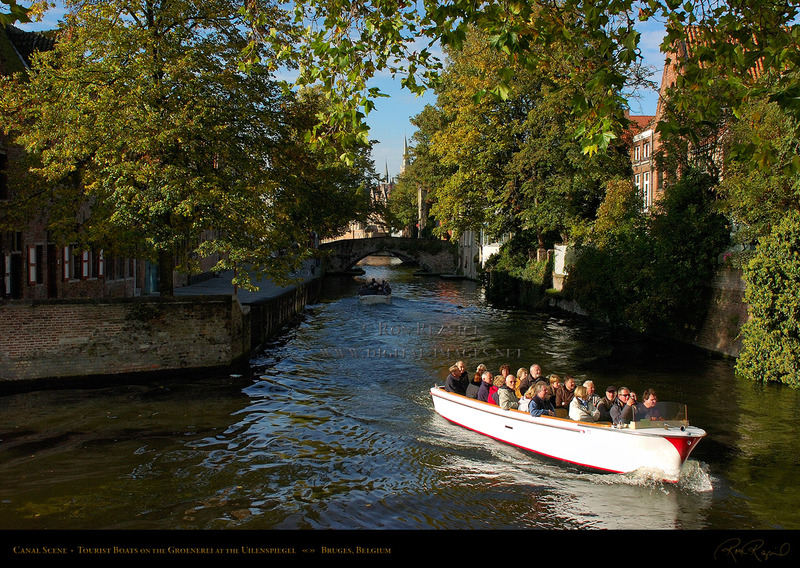 The Dijver runs from the Rozenhoedkaai to the Gruuthuse Bridge, and is part of the original course of the Reie river. 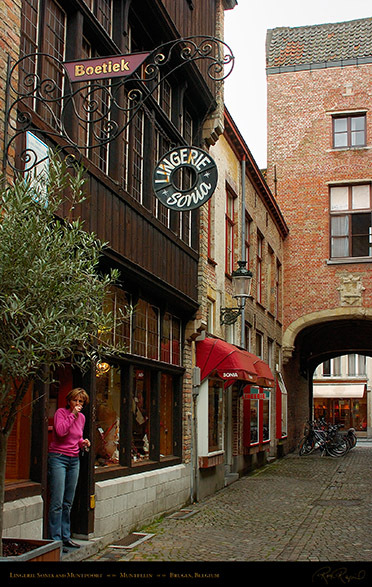 The Dijver and the street running beside it are the oldest in Bruges. 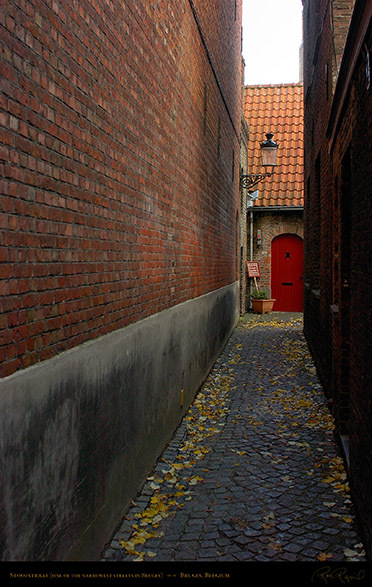 From 1127 it was part of the first city wall. from further down on the Dijver Canal. 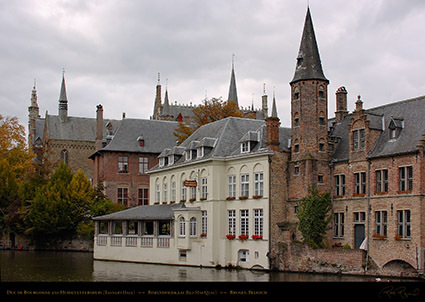 Hotel and the Huidenvettershuis (Tanner’s Guild House). 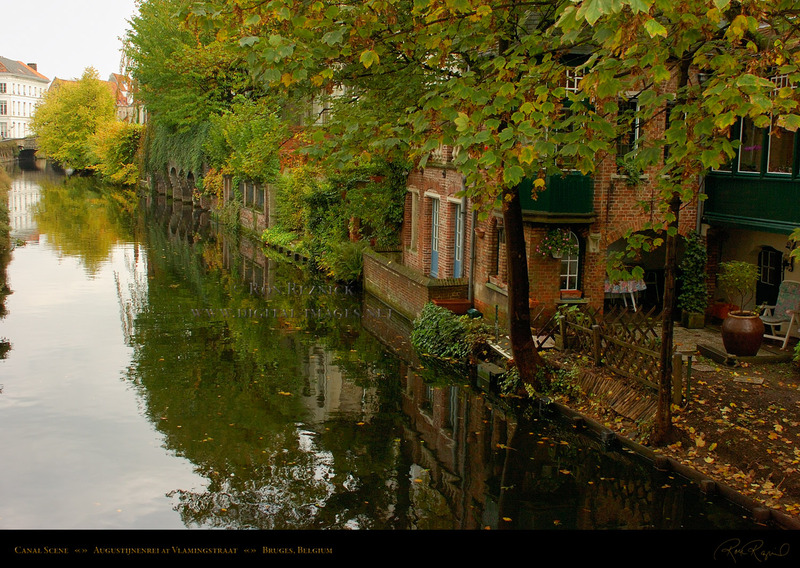 the tourist boats dock. This is opposite from the Duc de Bourgogne and Huidenvettershuis (the previous image). Swans traverse the Rozenhoedkaai between the Wollestraat hotels and the Duc de Bourgogne, overlooked by the Belfort. 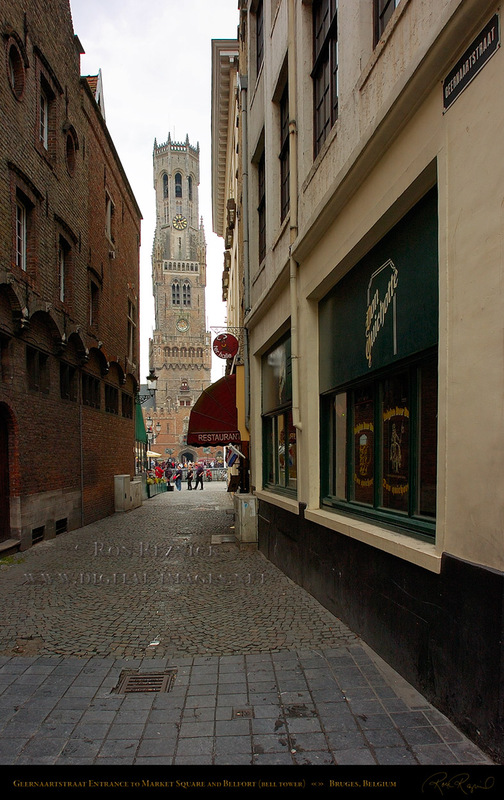 13th century Belfort (bell tower) is in the center background. 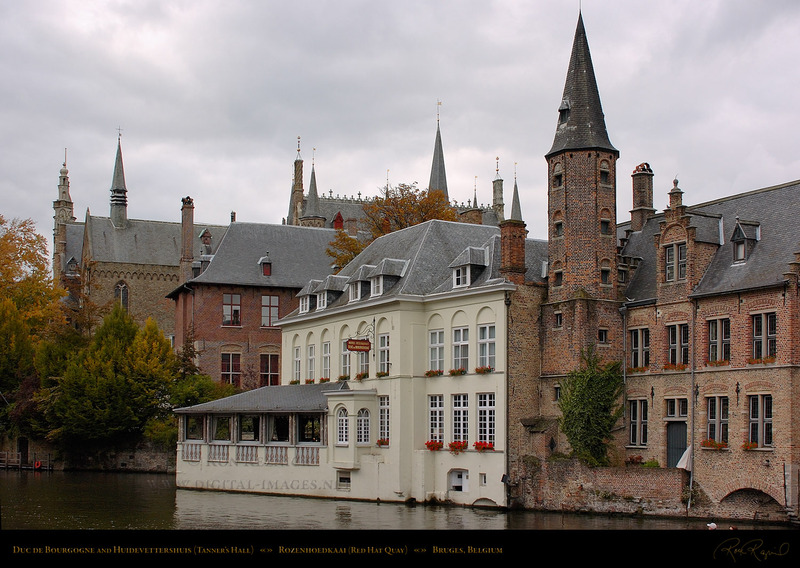 Duc de Bourgogne hotel and restaurant and the Huidenvettershuis (Tanner’s Guild House) at right. the Wollestraat hotels and the 13th century Belfort (and a serendipitous rainbow). 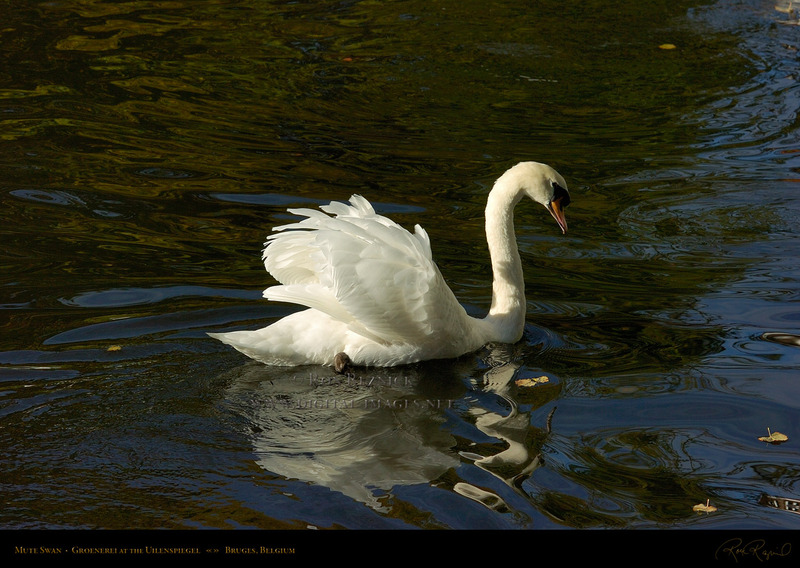 A Mute Swan traversing the Groenerei at the Uilenspiegel. 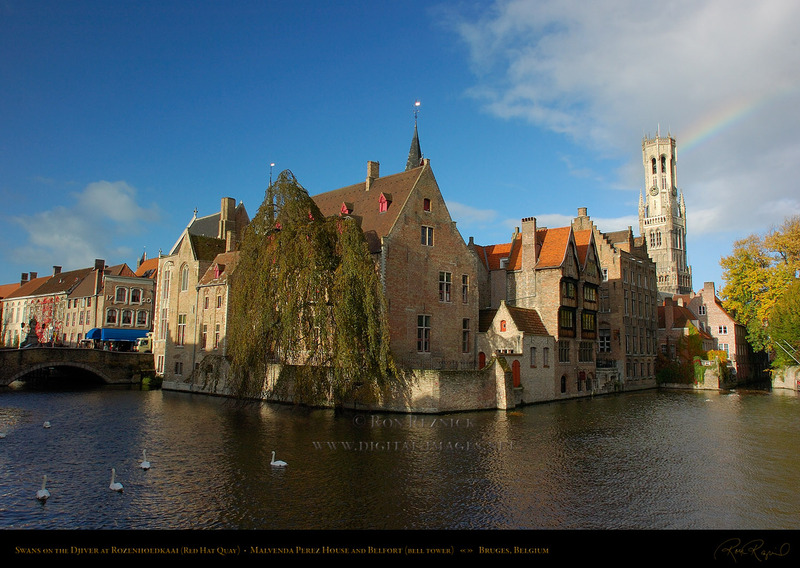 to keep swans on the canals for eternity (the swan was a symbol on the Lanchals’ Coat of Arms). 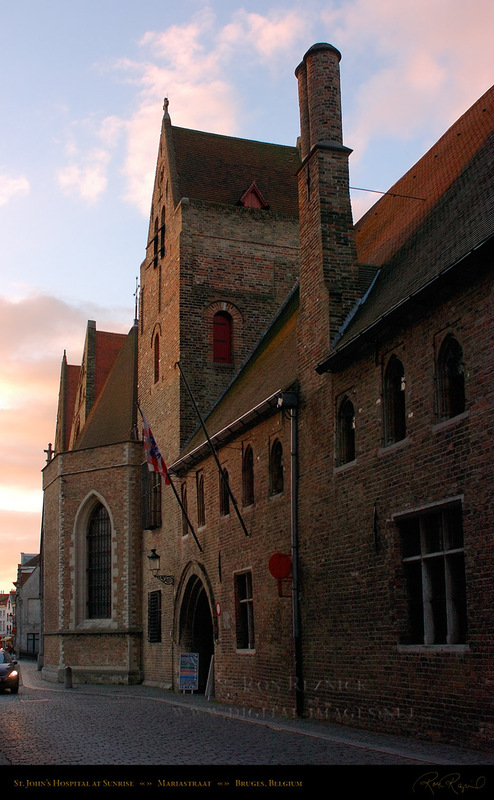 13th century Belfort (bell tower, 1240) in the background. with the iconic landmark bell tower of Bruges in the distance. 17th-18th century shops and buildings on Gelmuntstraat. 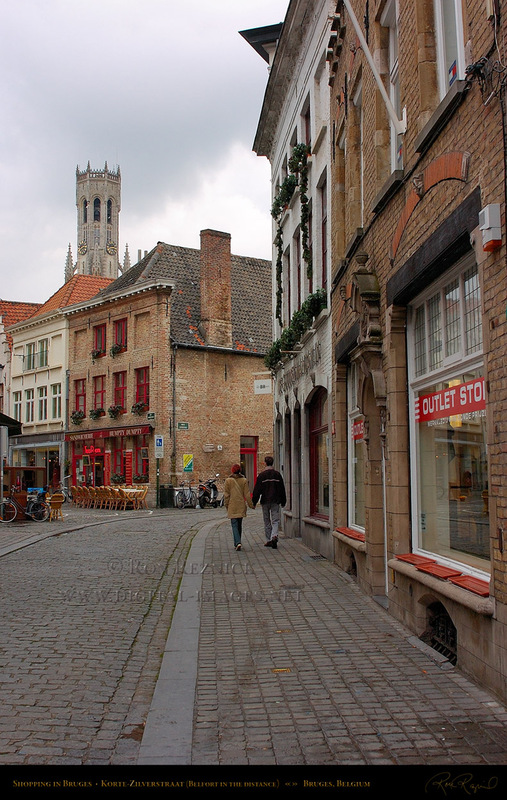 A bicyclist passes shoppers on Gelmuntstraat in Bruges. 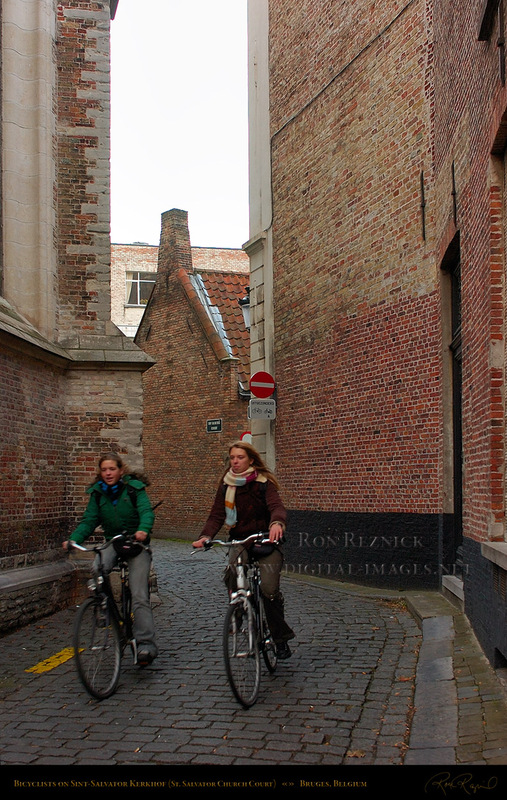 on the Sint-Salvator Kerkhof on their way to school. (broad house), corner of Vuldersreitje and Langestraat. The view down Langestraat from Koopmansstraat. 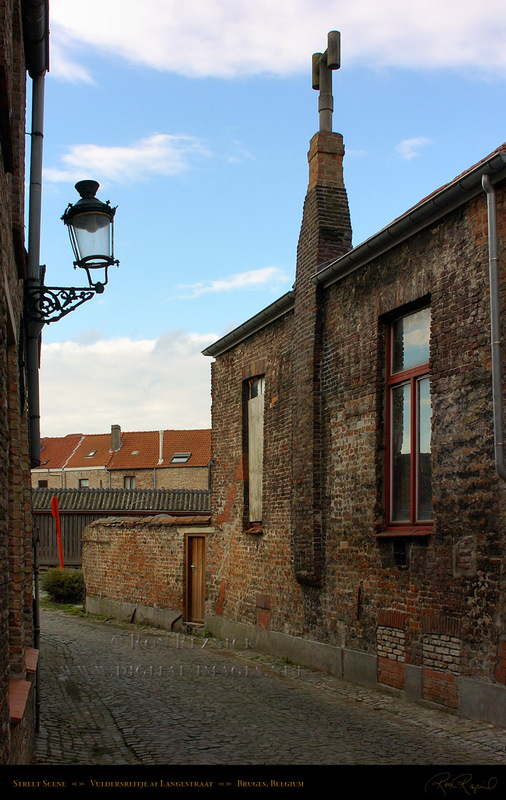 The 17th century house with stepped gable is next door to the 1850 facade of the 14th c. house shown in the previous image. 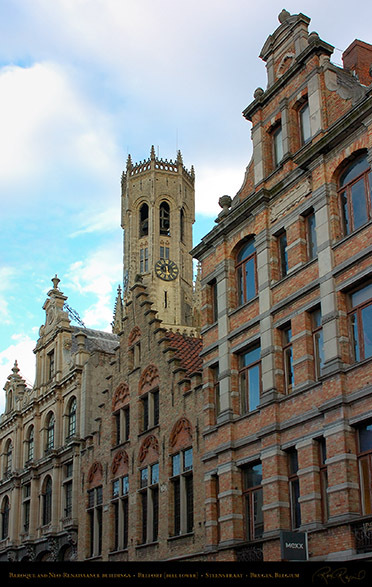 Walplein Restaurants at sunrise, with the brickwork tower of Onze-Lieve-Vrouwekerk in the background left. 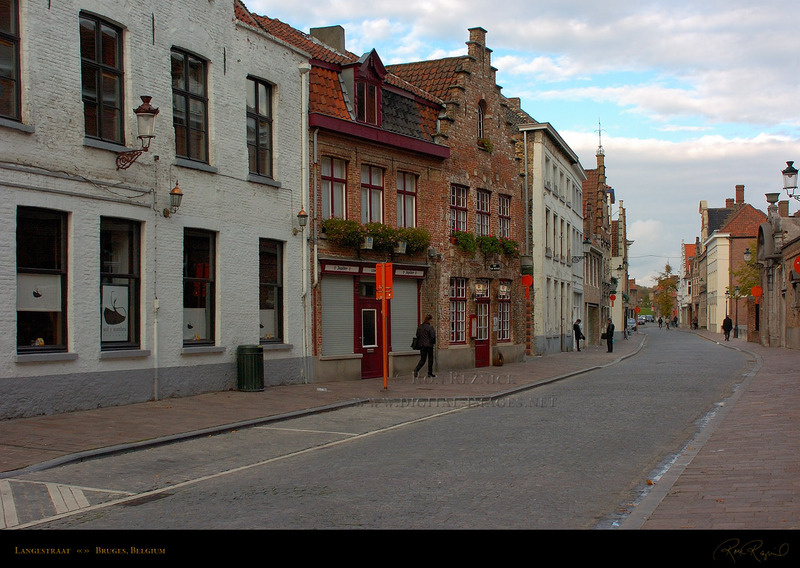 The Walplein was a trading place for Walloons and French merchants. The Eiermarkt (Egg Market) entrance to Grote Markt (Market Square), with the 13th c. Belfort (bell tower) at the right. The Tavern “Te Buerze” (17th century) is at the end of the street. 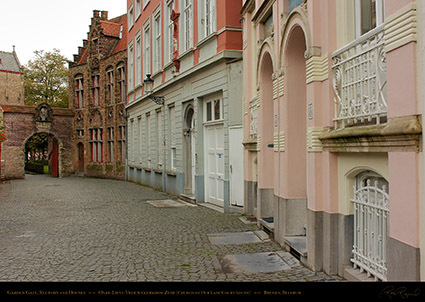 Onze-Lieve-Vrouwekerkhof-Zuid (Church of Our Lady Court South) with the 19th c. Neo-Gothic Rectory and garden gate beside two Neo-Classical and Art-Nouveau homes. 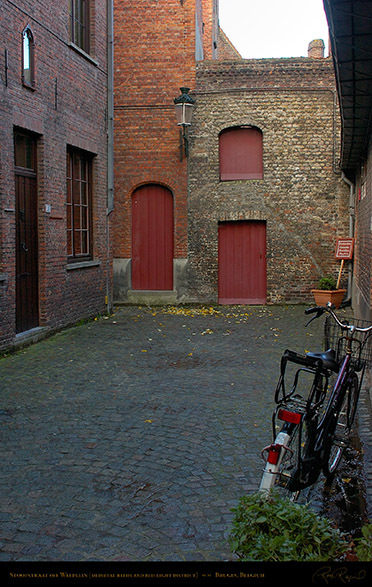 (deep houses) at numbers 10-12 (all were built in 1904). 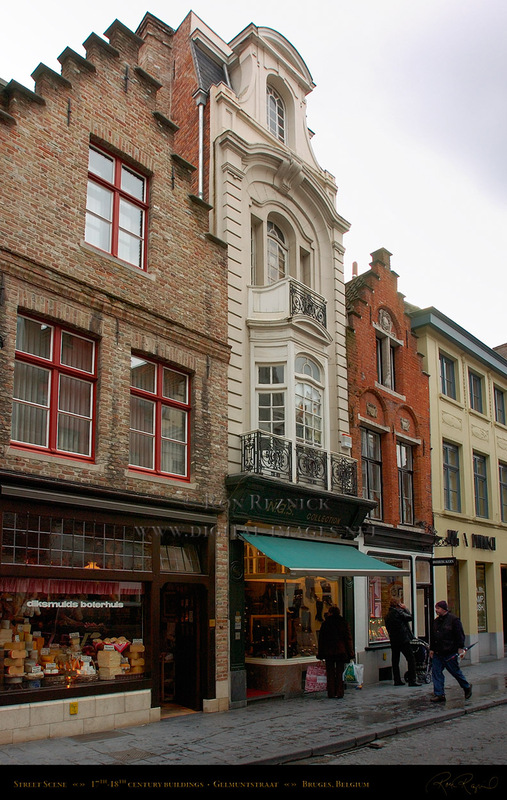 The Baroque Eclectic and Neo-Renaissance facades of two late 19th century to early 20th century buildings surround the stepped gable of Den Arent on Steenstraat (built in 1626). 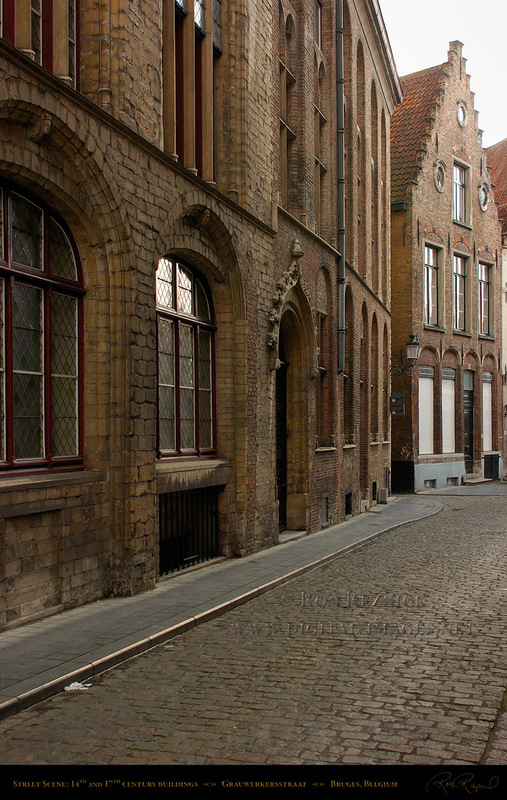 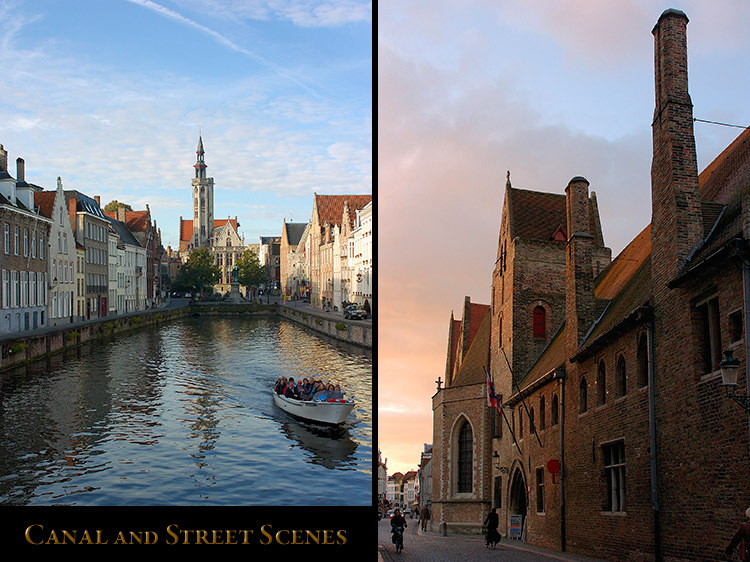 The streets in Bruges offer a variety of architectural styles. A 17th c. (pink) Neo-Baroque facade with stepped gables next to the 17th century State Archives building (see right). 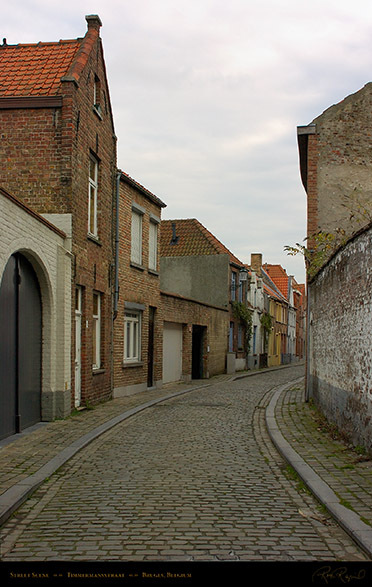 At the end of the street are 15th c. diephuizen (deep houses). 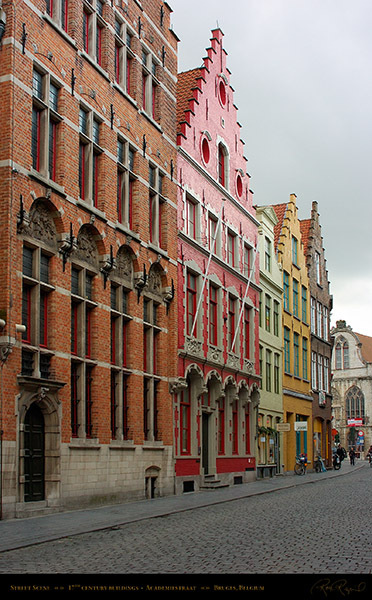 The yellow 15th c. diephuis was named the “Sint-Sebastiaan”. 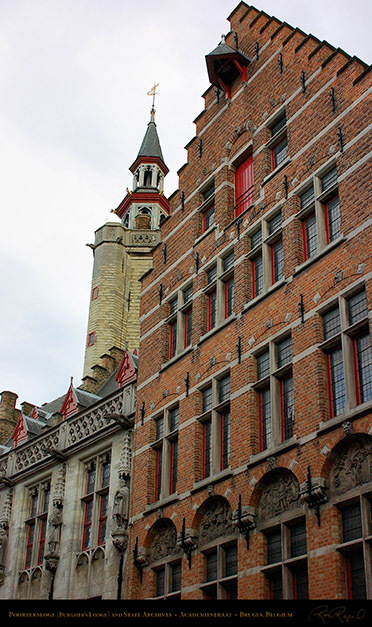 A steep oblique of the 17th century State Archives building beside the Neo-Gothic tower and cornice of the Burgher’s Lodge (Poortersloge), which was built between 1395-1417. 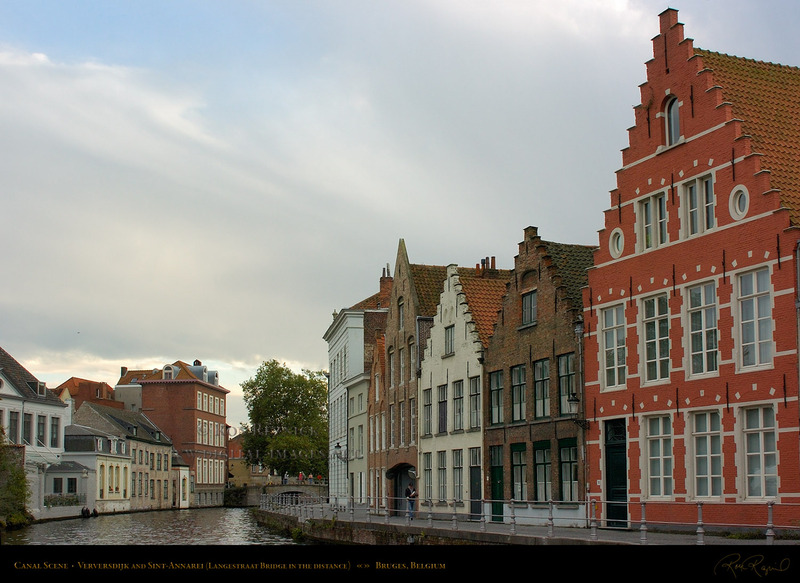 The 14th century building at left is the Friet Museum. 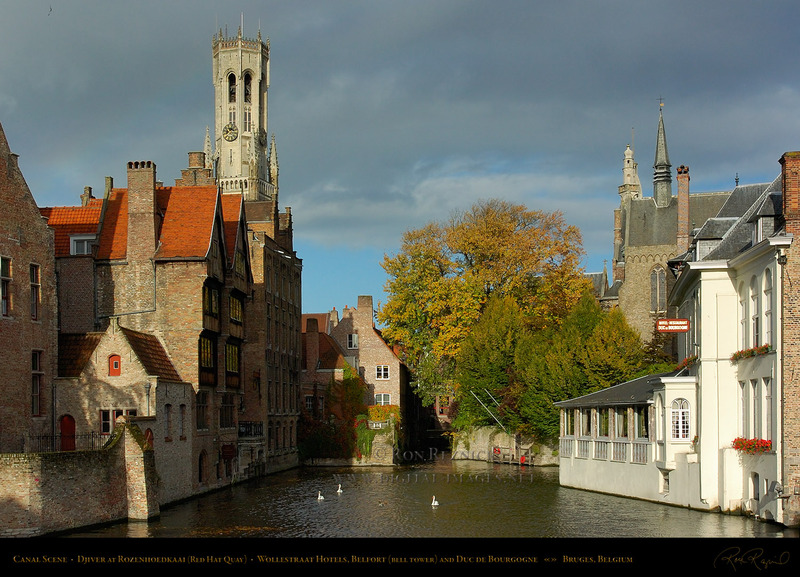 Only in Bruges would you find a museum glorifying the French Fry. The building at the end of the street is a 17th c. diephuis. The Eclectic facade of a Neo-Bruges-style diephuis (1907), on Grauwerkerstraat a block from the 14th c. potato palace. 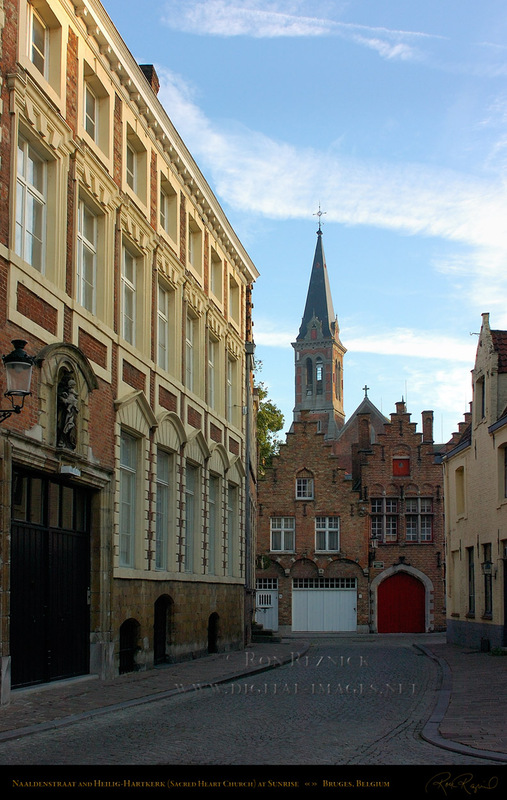 The Neo-Bruges house on Grauwwerkerstraat shot at sunrise from Naaldenstraat with the tower of Heilig-Hartkerk (the former Jesuit church of Bruges) in the background. Korte Sint-Annastraat (Short St. Anna Street), is one of the narrower medieval streets. The Sint-Annakerk Tower is in the background framed by the medieval buildings. Numbers 26 and 28 Moerstraat at Sint-Jakobsplein are two 15th century diephuizen (deep houses) restored in the 1890s. 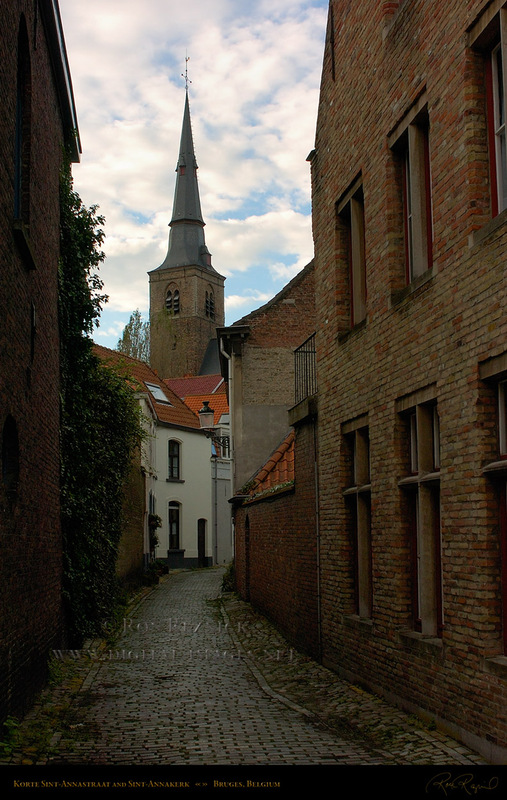 Sint-Jakobskerk and No. 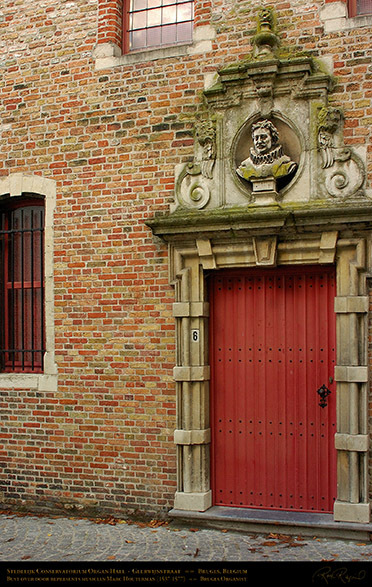 26 Moerstraat, the Presbytery. 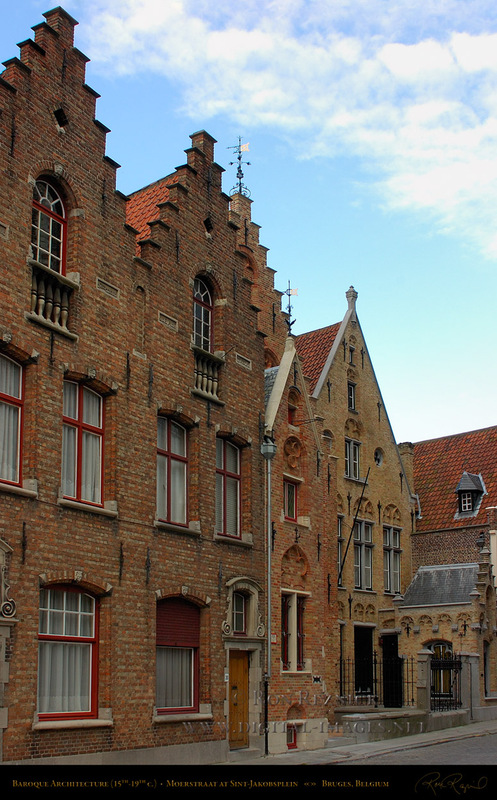 The 15th century diephuis was restored with a Neo-Gothic facade and stepped gable only partially inspired by the original. One of the narrowest streets in Bruges (you can easily touch both sides), Stoofstraat (Stove Street) was once where you could get a hot bath (it was also a part of the red-light district). 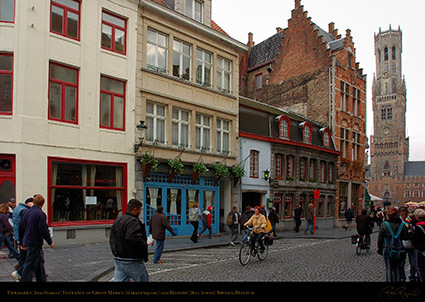 The medieval court at the end of the narrow street shown at left. The narrow part of Stoofstraat cuts between buildings on Katelijnestraat and ends in a U-shaped court off the Walplein. Ontvangerstraat with the Grand Hotel du Sablon at the end. 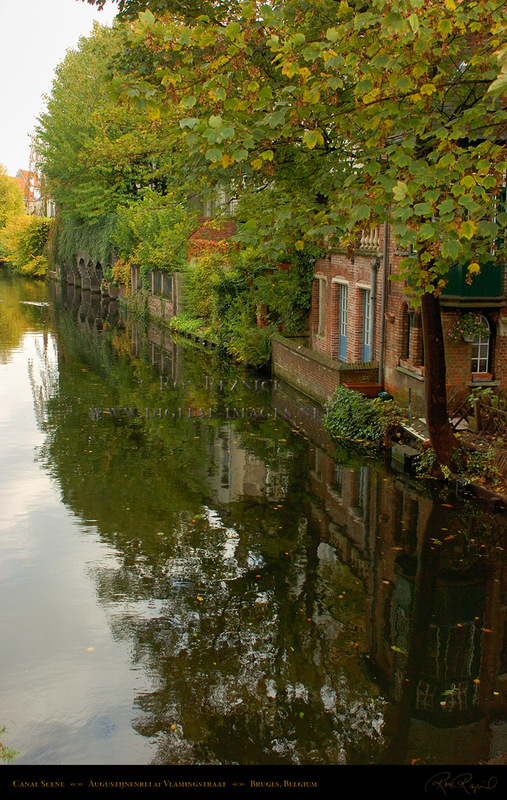 16th century canal houses on the Groenerei (Green Canal). 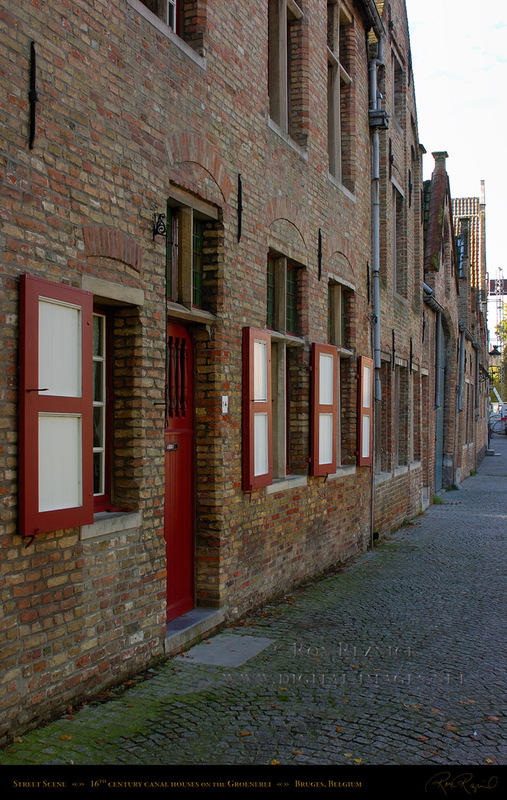 Houses on Timmermansstraat just off Molenmeers. Early morning sunlight illuminates a park lane in Bruges. 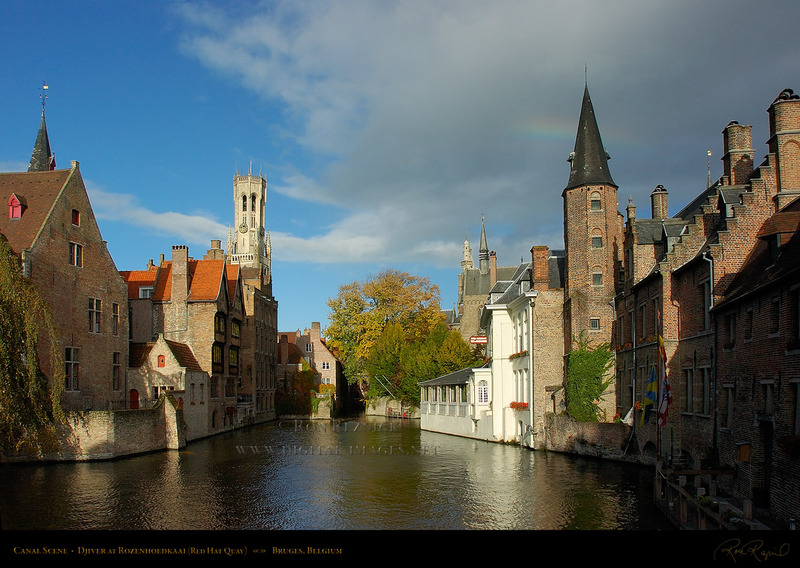 Belgian Pancakes and other traditional Flemish dishes. The Stedelijk Conservatorium Organ Hall on Geerwijnstraat with a bust of Bruges organist Marc Houterman (1537-1577). 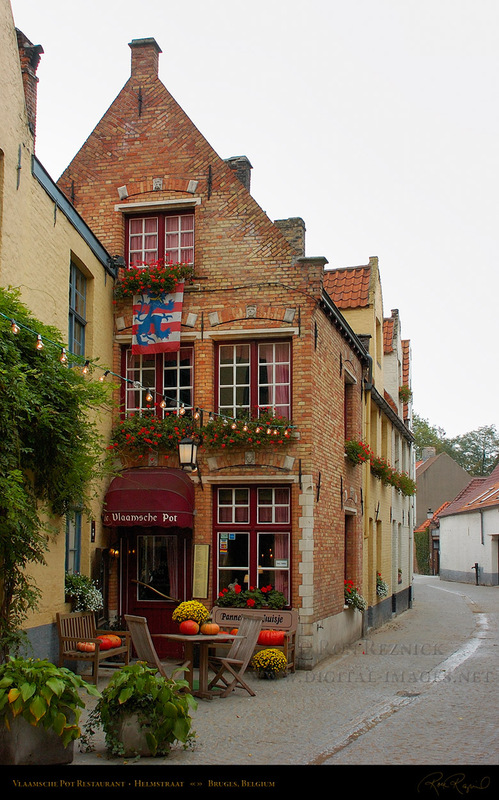 Near the Prinsenhof (see the Houses and Buildings page) is the Muntpoort, a medieval gate. 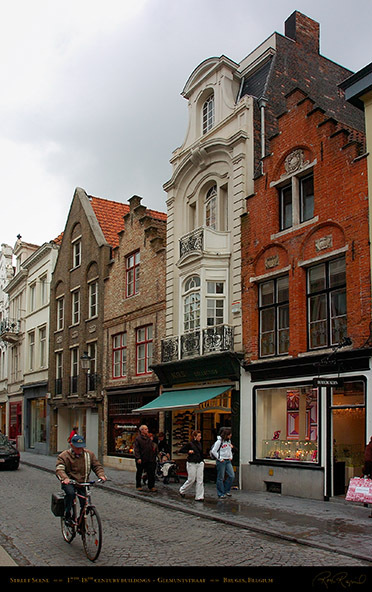 It leads into the Muntplein, a square with shops and boutiques, one of which is above. 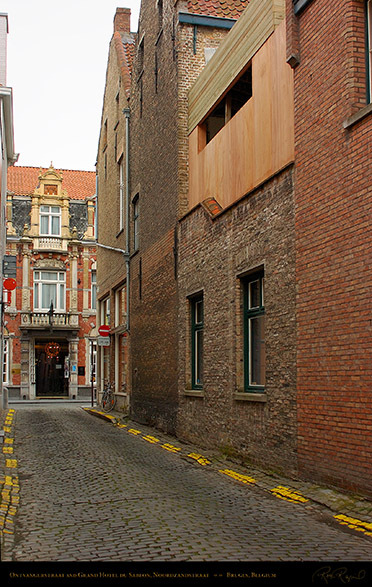 Lingerie Sonia is in a combination broadhouse/deephouse which was rebuilt in the 1960s. 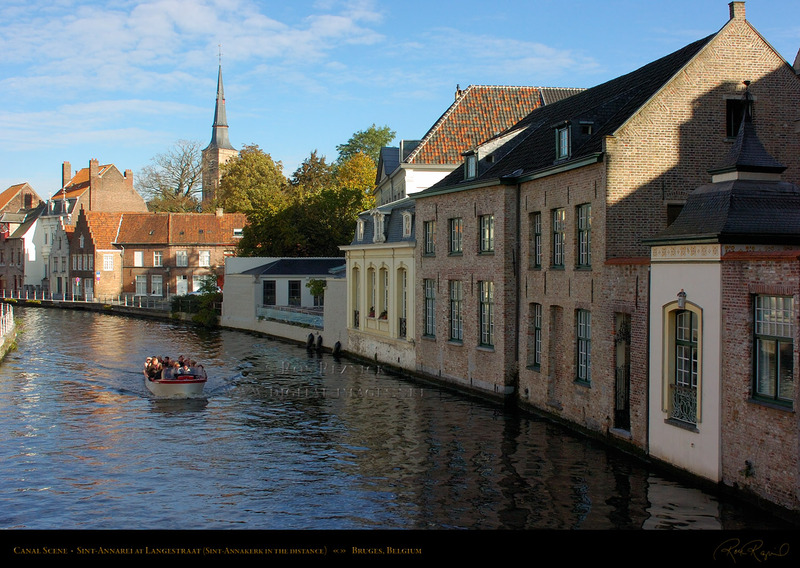 The building beyond it is a 17th c. diephuis built over the Marcus Gerard mint (1562). 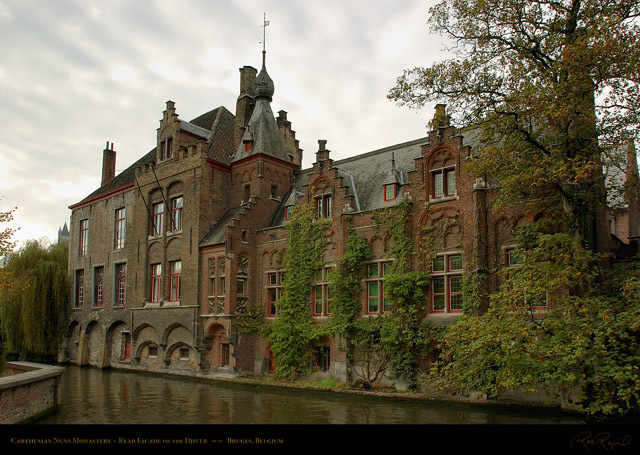 Sint-Janshospitaal is one of the oldest hospitals in Europe. 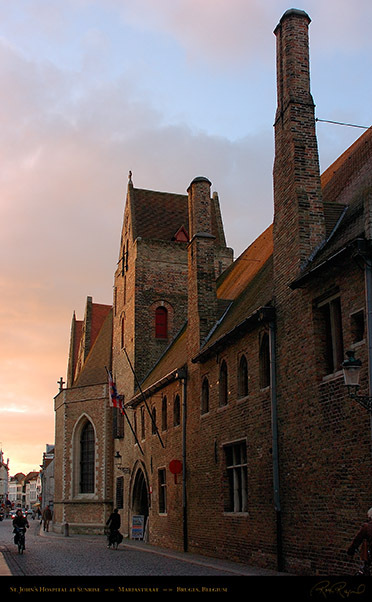 The earliest documentation dates from 1188. 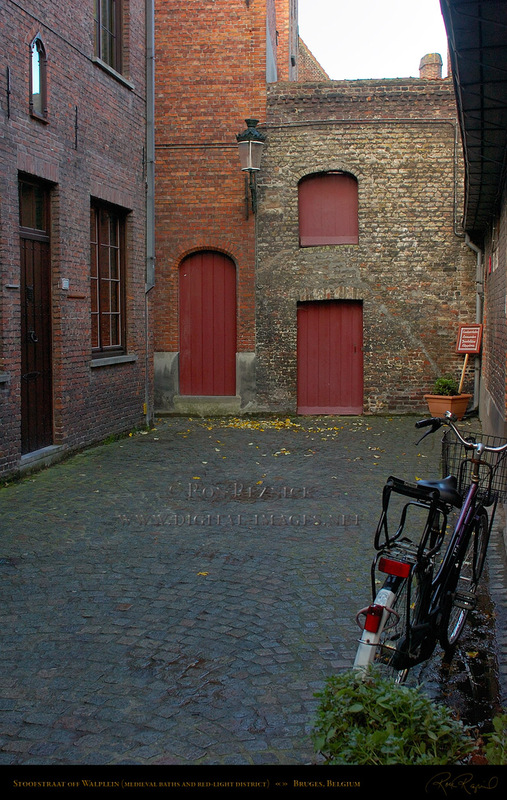 This is the oldest part on Mariastraat across from Onze-Lieve-Vrouw. 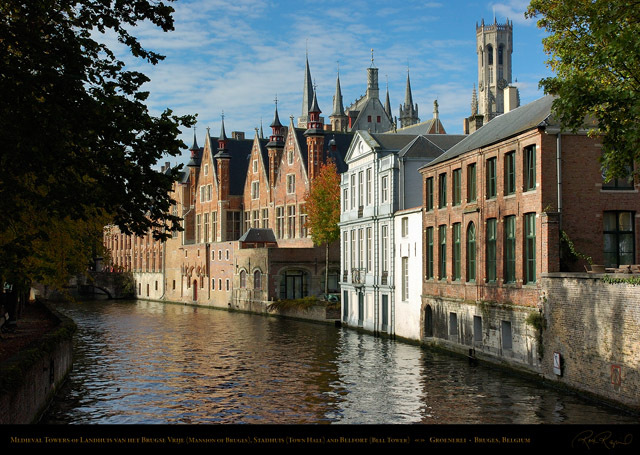 into a cultural and meeting center and the Memling Museum. More images of St. John’s Hospital are available on the Houses and Buildings page.